Save yourself the trouble of experiencing vehicle issues by running a free VIN check. This will allow you to learn about a vehicle’s issues without owning it yet. In addition, the New York DMV can be requested for information about New York cars. Call the agency at 1-518-486-9786. You may also reach out via online medium, other mobile numbers, or office visit. A qualified car insurance is needed to register and drive a vehicle in New York. Failure to comply with the said policy can result in your vehicle registration and driver’s license being suspended. New residents have 30 days to register their vehicles. Residents who bought their cars outside the state have the same grace period as well. 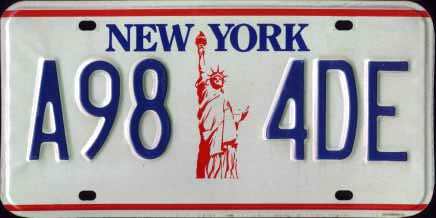 Generally, a New York passenger plate contains three letters and four numbers. Provide a police report for your missing or ruined plate to get a free replacement. More details about replacement plates can be found on the Lost, Stolen, or Destroyed Plates page. You can choose any of the eight (8) plate categories available for your vehicle unit. Take note that each category may contain different requirements. Check the requirements to order personalized plates online. Provide the state’s requirements to grant your request for license plate transfer. You may only transfer your own plate to any car that you own. The titling application is generally included when you register a vehicle in New York. With the exemptions of vehicle units that were made in 1972 and earlier, all passenger cars must be titled to permit their operation within the state. The New York DMV offices are the designated places for titling vehicles. The applicant must give a completed title form to the assigned officer to begin the title application. Make sure the data you will present are correct to prevent your application from being rejected. Bring your ownership documents and proof of purchase, along with your payment for the fees and taxes. If the authorized DMV agents were able to confirm your request upon submitting the requirements demanded, the title will be mailed to you within a few weeks. Contact the DMV if you have not received your title within three months, or if your title requires correction. If a car has a lien, it will be confirmed by the New York DMV. Provide a completed lien release form or its equivalent to prove that the lien has been satisfied. A title-only application form may be completed by the owner if the car already has a valid registration. For missing New York titles, a replacement title can be requested online and it will be delivered to the registered owner’s address within 15 days. In addition, you may also ask for a replacement by mailing the replacement title form to the designated address. To know more about the titling process in the state of New York, visit the Title Guidelines page. Buying a used car in New York? Don’t make a costly mistake. Run a Free License Plate Lookup for your New York-registered vehicle! Run a Free New York License Plate Lookup to uncover the full-story of your New York-registered vehicle.